Most of the Carpathian mountain range begins near Bratislava (Slovakia) and ends in the south-east near the Iron Gates (Romania). Due to the geographical location of the Carpathians play for Central Europe a very important social, economic, resource, klimatotvorchu, hydrological and ecological role. In this area there are more than half of the total biodiversity of Central Europe, are the main area forests that support ecological balance, soften the climate and with ridges protect Prikarpattya southern Europe from cold winds. The Carpathian Mountains are very beautiful, they are soft, usually without rocks, outlines, which reach heights of over 2,000 meters. The Ukrainian Carpathians are preserved in the largest forest in Europe. On biodiversity and variety of relief and landscapes Carpathians significantly higher than all other regions of Ukraine. The most popular uses of lumber edged. Make it out of softwood, such as spruce, fir, pine, and are mainly used for finishing work and building frames and supporting structures. The name of the Edged received due to the fact that in the coated crust, cut the longitudinal edge sawing logs. As a result, top edged boards, a smooth, pleasant to the touch, which increases both demand and cost Eaves on the market of construction materials. Almost everyone who lives in the countryside, or at least has his own house, sooner or later faces the need to use a wooden board. This could be the construction of a house for the dog squad to pets or poultry. Typically, these are jobs that do not require significant knowledge of carpentry. The following information will be useful for business owners, and for those who are professionally working with wood. So, first of all we need to be able to distinguish plaque on their appearance. There are two main types of material - edged and unedged. Their difference lies in that in the first case at the corners along the entire length of the board there is no residual cortex. In the second case, the crust is present, but within certain rules, in accordance with the board categories. In this article we take a closer look is edging board. This type of board is most often used for so-called "clean" work. This means that it is made of tables, chairs, doors, shelves and other furniture, where every millimeter is important, as well as her appearance. Dimensions that are used are usually written as «a», «b» and «l», where a - the thickness of the board, b - width, l - length. In practice, this may look like a 30*250*4000, which stands for the four-meter board in the thirty millimeters and a width of two hundred and fifty. In another option board can be divided into "raw" or also called "wet" and "dry". Since the moisture level of 22% greater than the first, and secondly less than this figure. Most people, who does not know all the subtleties of working with this material, buys the "wet" boards because they are cheaper than dried. However, remember that over time, these boards is required to deform and can negate all your work, so the cleaner works better to buy dry or before chto-to tinkering, let them dry well. In any case, we offer a wide range of edging boards both dry and wet, at affordable prices! "Rivbud" - offers for sale from a warehouse smt.Rozhnyativ, Ivano-Frankivsk region (Call +38(097)837-76-79, Mikhail). • Round logs (the price of round logs - specify in the office of the center). Pallets - selling, buying pallets, trays, manufacture of wooden pallets, blanks for pallets. Pallets (120 Euros/cubic meter on FCA). Unedged pine - not edging board (950 UAH/cubic meter), sawdust. Forestry and export of timber from the mountain and marshland - in more detail, see the special services section. 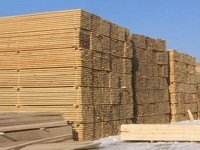 Long term rental of forest plots and own production of lumber, allow us to keep a reasonable price for lumber throughout the year. On the company's warehouses always have reserves of products, and an individual approach to each client allows us to meet the wishes of each customer. All boards are made of high quality raw materials that have passed quality control. Raw materials used for the production of sawn timber, complies with environmental and functional norms of European standards. Prices for sawn always correspond to the market. For regular customers and for large volumes of provided discounts.